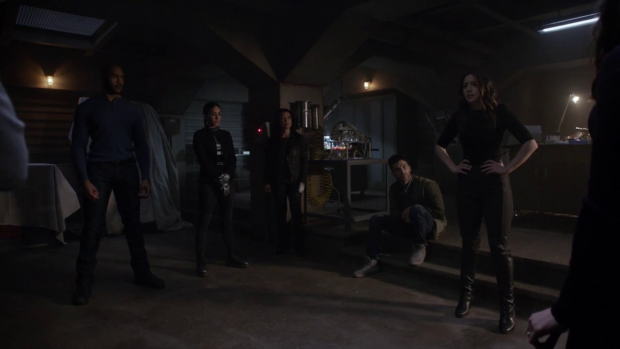 Marvel’s Agents of SHIELD prepares for the finale by exploring Talbot’s motivation and letting the team take the fight to the aliens. This is an episode that definitely favours action over plot but that doesn’t make it a bad episode. It’s actually quite the opposite and makes for a confident outing for this show. An episode like this is possible because a lot of really good work has been put in to develop the characters and the narrative to a point where the emphasis on action is earned and doesn’t cause any detriment to the overall arc. That’s not to say the plot doesn’t progress because it does in several ways but on the whole the episode spends a lot of its time with characters taking very small steps. For example Coulsou and May are locked in a cell on the alien ship for a sizeable portion of the episode with the rest of their screen time devoted to getting off the ship. In terms of narrative movement that’s not a lot but their escape does put them in the place they need to be for the season finale. This more focused and deliberate plotting for these characters allows their relationship to be the focus. Spending so much time with them trapped in a single location means that the writers have to use their dynamic to ground their scenes. As always Clark Gregg and Ming-Na Wen bounce off each other effortlessly and it has been long established that their characters make a great team. Their heated argument about who gets to potentially sacrifice themself is also classic Coulson and May as they have both always been willing to put themselves on the line for the good of the team. The argument has an undercurrent of flirtation to it when Coulson calls May out on giving him an order before pulling her behind his holographic shield and kissing her. It’s a great moment that is the culmination of years of will they/won’t they storytelling. Their relationship has always been complex and satisfying and this moment between them feels right. Daisy’s reaction to it makes it even better. In the midst of a firefight it causes her to lose her concentration as she looks on with gleeful shock before remembering there’s an attacking alien to deal with. It’s hilarious, fits with her character and does great service to the relationships that have been built up over the past 5 years on this show. When she brings it up to him later it has a juvenile quality to the conversation which makes for a fun moment and emphasises the father/daughter dynamic between these two characters with Daisy slipping naturally into a more immature role for the purposes of that discussion. May and Deke make for a fun pairing in this episode with May handling all of the combat and Deke using his rudimentary understanding of alien technology to send them back home while also redirecting the missiles aimed at the Lighthouse. The latter is simple enough since the missiles are already targeted at the lighthouse so it’s just a case of matching the symbols on the alien teleporter to those on the weapons system. Effectively it’s a really high stakes game of Mahjong or Snap. Resetting the missile coordinates is more difficult but is front loaded by Deke telling Coulson and May that he knows six numbers including zero in that language. Deke’s triumphant declaration of “I know zero” is a badass one liner followed by the satisfying destruction of the alien ship. The action in this sequence is nicely handled as well with May holding her own against Qovas who proves to be formidable. Keeping the focus on Deke as he tries to avoid being hit by a wayward blade helps maintain the momentum and makes him an important part of the sequence while making sure there is a threat value attached to his presence. It is somewhat played for laughs which is in keeping with this show’s overall approach to storytelling but it doesn’t diminish the sense of urgency. Daisy’s conversation with Taryan is brief but really interesting. Taryan’s aim is to break Daisy to make her one of his slaves and he conducts the conversation as if he’s in complete control. Last week hinted at his manipulative streak with this episode fully confirming it as he tries to belittle Daisy into bending to his will. He brings up the treatment of Inhumans by Humans and how frustrating that must be for her. It’s something he keeps coming back to indicating a sense of emotional blackmail that he thinks will have an effect on Daisy. Amusingly it’s when he reveals his association to Kasius that Daisy becomes unbreakable because it gives her the upper hand by way of knowledge that he doesn’t have. She also knows how the future plays out to some extent to at least realise that she gets out of this situation. Taryan is definitely no threat to her and she confidently defies him by pointing out that Humans are complicated and something she is willing to deal with. This seems like a good exit point for Taryan since he wasn’t on the ship in the first place. 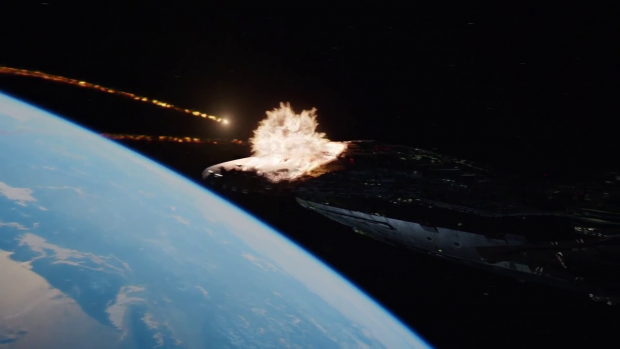 Not to mention the fact that the ship is destroyed which suggests that the threat for the finale is more Earthbound. I feel that not enough has been done with Taryan given the work that was done to establish how much of a threat he is. It’s true that he could reappear in future seasons should the show continue but there was definitely more potential for the character after his introduction than his short appearance in this episode allows. Fitz and Simmons are continuing to work on the Centipede Serum so that it can save Coulson. Once again this is plot that moves forward gradually but focuses on the characters. 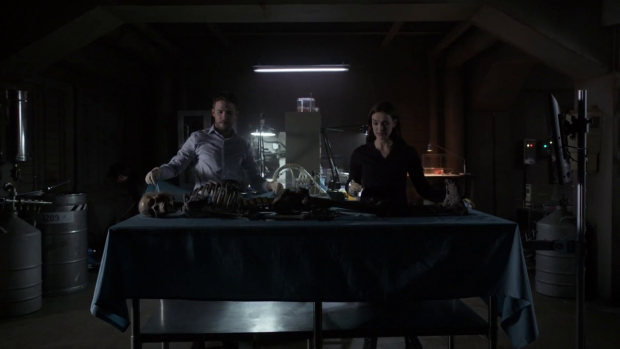 Up until now Fitz has been somewhat defeatist because his belief is that knowing the future doesn’t mean that it can be prevented so he feels that all they are doing is playing their part in events but the work he and Simmons do on the serum is so promising that it is all but guaranteed to work. It is known that Coulson doesn’t make it beyond the point that the Earth is destroyed so ensuring his survival is a definite way to break the loop. Fitz begins to hope that if they can save Coulson then saving Earth is also possible. It’s an important step forward for him because it means that he’s now working towards a hopeful outcome rather than going through the motions on what he feels is inevitable. Of course there are other things that aren’t considered such as the possibility that Coulson is saved but doesn’t make it in some other way or the timeline does change but not enough. None of that is especially important in terms of how Fitz and Simmons feel as the sense that they are starting to hope for a better future is most significant here. The subtle showing of the tension between Mack and Fitz is a really nice touch as well as it shows a willing professional connection with a damaged friendship. Characters in this show do broadly act like adults so it’s good that the issues they’re having with one another don’t impact their ability to do their jobs. The escalation of Coulson’s injury just as a solution is found is timely and makes dramatic sense. It introduces a difficult choice that the team have to consider as the Centipede Serum can also be used to neutralise Talbot but there is only enough for them to either do that or save Coulson. It’s a simple choice between saving someone they care about or saving the world and it’s on the characters to make that choice. Based on how Fitz’s outlook changes I’m unsure what his vote will be at this point though Coulson will definitely ask them not to save him because it has been well established that he has come to terms with the inevitability of his death and has no desire to be saved. Going into a season -and possibly series- finale this sort of character driven drama is exactly what is required and it makes for some fascinating plotting. Mack and Elena seem to be reaching a little bit of an understanding even though that tension does still exist between them. Their discussion is very much morality driven by using the example of when Creel killed Isabelle Hartley. This action caused Mack to hate him because Hartley was his friend but he realised that Creel had been brainwashed and that there was a decent guy under the H.Y.D.R.A. programming. This same thought process applies to Talbot who he already knows to be a good man and understands that he has been corrupted by everything that has happened to him so wants to try for a peaceful resolution first. He’s not naive and does acknowledge that the only way to stop Talbot might be killing him which is something that Elena makes clear to him. Mack resolves to be the one to shoulder that responsibility and make that decision. This further frames Mack as the conscience of the team while Elena’s moral judgement is still askew. Once again these are characters who are focused on their jobs while not allowing the personal tensions to impact their ability to do it. Talbot’s development in this episode is fully geared towards him becoming the villain of the piece in time for the finale next week. This is handled in really clever ways that allow Talbot to continue to be a nuanced character. Many people say -myself included- that the best villains don’t see themselves as the bad guy. Talbot is motivated to save the world from Thanos and feels like he needs more power to do that. In his mind every decision he makes is in service of the greater good and his shattered mental state warps his perception of his own reality so that he sees himself as a superhero. There are two key scenes that establish how Talbot’s thought process is working. The first is when he talks to Creel and encourages him to join the collection of people that have been absorbed by the Gravitonium. As far as Talbot’s concerned this gesture helps Creel because it will allow the voices in his head to be silenced and make him part of the pseudo hive mind that Talbot presides over. Creel doesn’t understand what Talbot means and wants rid of the voices which ends up bringing him to a tragic and unwanted end as he is absorbed. Talbot sees this as Creel becoming part of a combined stronger whole rather than murder and that distinction is important when understanding his motivations. The second key scene is the conversation he has with his son George. There’s a creepy undertone to this scene as Talbot seems to be trying a little too hard to get George on side which suggests that having the approval of his son is important to him. The Avengers are mentioned directly because George likely idolises them so he wants to be seen in the same light. If George sees the Avengers as heroes then it’s Talbot’s aim to convince him that he is a hero like the Avengers. Basically he wants that approval because it helps justify his behaviour. At first George seems impressed by his father’s newfound abilities but that quickly transitions to fear when it becomes clear to him that Talbot has changed into something other than the man he knew. Things like threatening his mother are clear indications of that but the discomfort with the conversation starts to grow long before that. This pays off when Mack and Elena show up trying to reason with Talbot and he attacks them. George tells him that he’s actually the bad one and Talbot starts to show a crack in his resolve as he tries in vain to convince George otherwise. Despite this he still thinks that he’s the one to save the planet and tells George to keep watching the news for proof of how much of a hero he is. At this point he’s delusional and I wouldn’t be surprised if George’s words start to haunt him in the final episode which could eventually be the key to his downfall. Since the team are no match for him in terms of powers there will have to be a more character driven solution. Those are always more effective anyway and the framework is in place to allow this to happen. An excellent episode that takes full advantage of the strong narrative movement over the past few weeks to deliver an action packed outing that is more focused on the characters than plot. Coulson and May spending a good chunk of their time on the alien ship is a great touch because it allows more time for their relationship to be explored relative to this situation. Their argument followed by a kiss is a great moment because it fits with their relationship and makes for a satisfying development to their long flirtation. Daisy’s gleefully shocked reaction only serves to enhance it. Her conversation with Taryan is interesting and shows Taryan’s manipulative nature in a really compelling way with Daisy turning the tables on his efforts as soon as she learns his name which gives her the confidence to realise that he’s currently no threat to her. Taryan had a lot more potential than his short appearance allowed so having so little of him on the show is definitely a misstep. The action in this episode is great. May taking on Qovas as Deke works to reset various coordinates to engineer their escape and redirect a missile attack was nicely handled with the focus being on Deke helping to show that he was in danger. The destruction of the ship and Deke’s badass one liner was excellently done and moves the threat for the finale in a more Earthbound direction. Fitz and Simmons realising that Coulson can be saved helps change Fitz’ mind on the possibility of altering the future and gives him hope for the first time in quite some time. 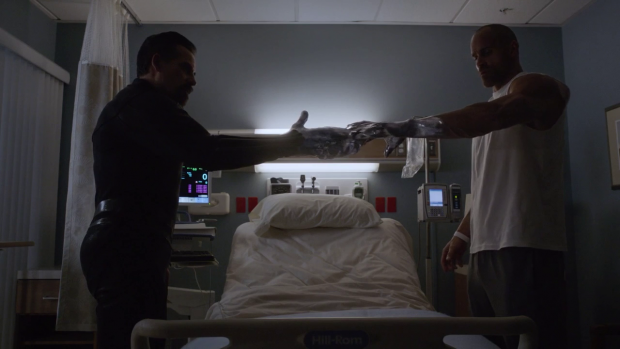 This adds extra tension to the escalation of Coulson’s injury as the team realises they only have enough Centipede Serum to either stop Talbot or save Coulson so the choice is between him and saving the world. No answers are given this week but the pressure this puts on the characters is effectively done. Mack’s strained relationships with both Fitz and Elena are used well in this episode by framing their connections as purely professional with an undercurrent of tension. Mack’s belief that people can be reasoned with further cements him as the team’s conscience but he is also shown not to be naive when he agrees to shoulder the responsibility of killing Talbot if it comes to that. Talbot’s development into deluded supervillain is really well done here thanks to two key scenes. His scene with Creel where he clearly genuinely thinks that absorbing him will bring him the help that he needs was great because it does fully commit to Talbot’s belief that he is a hero. The scene with his son George is a different spin on that. It shows that Talbot wants his son to see him in the same light he does the Avengers because being a hero in his son’s eyes is the validation that he needs. 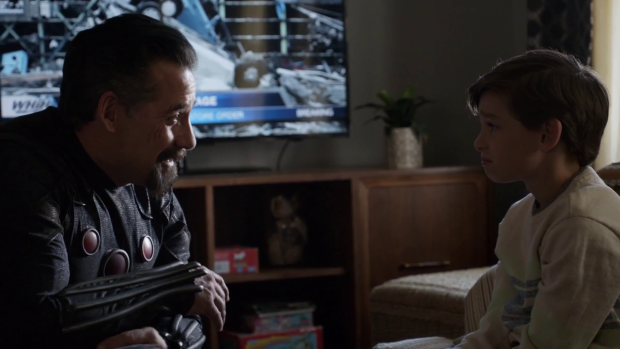 George rejects the idea that his father is a superhero because of the unsettling way he talks to him and his behaviour when it comes to threatening his mother as well as Mack and Elena. Talbot still wants to prove that he’s a hero but it’s clear that not getting that validation is something that affects him. Adrian Pasdar as Graviton is freaking amazing !!! This last episode felt, for the first time in far FAR too long to be like a genuine and honest film tie-in. 1) This is AFAIK Pasdar’s strongest ever performance. I hope his agent knows what he’s bloody well doing, and get him into some A movie. 2) I seriously hope that this is a premise to perhaps reeling Gregg in to either Avengers 4 or Phase 4. 3) If this is the final series of the show, then well bloody done !! 4) Chloe Bennet may not have A-list looks, but she’s a good talent playing a good character that everyone could use more of. I desire crossovers !! 5) On a tangent, I actually enjoyed the Inhumans show despite its obvious imperfections — if Agents of S.H.I.E.L.D. does get renewed, it would be great if those characters and their actors and at least a part of that narrative could be integrated somehow. I especially liked Black Bolt, Lockjaw, and Crystal. And the actress playing Medusa gave a great performance despite all. And Crystal — first MCU member of the Fantastic Four !! Charming actress too.